A few weeks ago I applied and was accepted to compete in the 100 Proof Press Design Contest using their beautiful Poppy image. The designers who were selected to compete in the contest were all supplied with the Poppy image and asked to create a project for the contest. I had a few things in mind, and in the end created an Easel card. To add color to the Poppy, I used the Marker Wash Technique (Pear and Peach Markers), then went back in and added a bit darker color to the areas that lightened when spritzed. 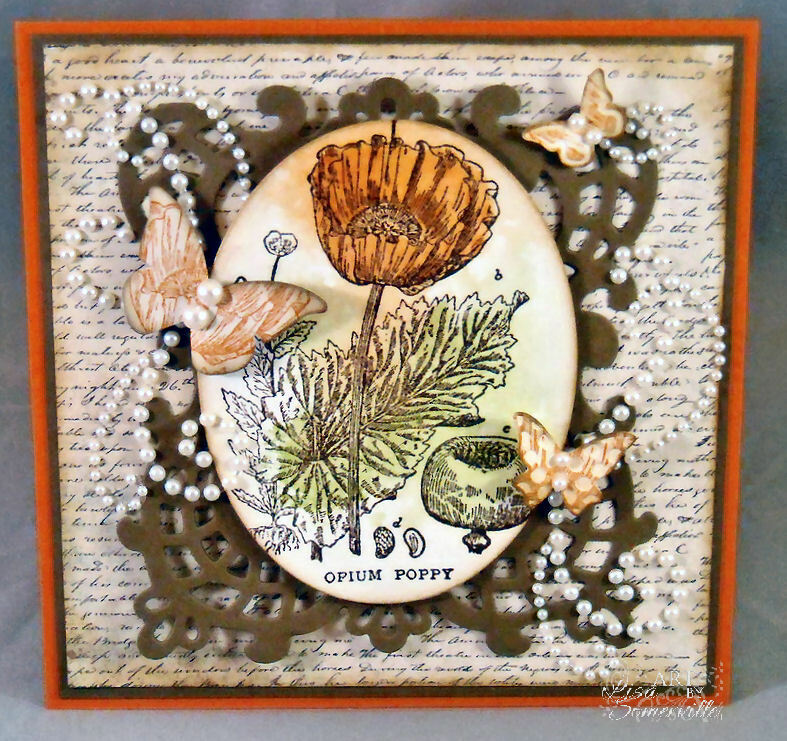 I also used the Poppy to add color to the butterflies, stamping the Poppy in Pumpkin, then sponging the edges. Here's the open view. I die cut the image with Spellbinders Oval Die, sponged the edges and adhered it to the Decorative Window Die from Heartfelt Creations. Adding the butterflies and Zva Pearls as embellies. Click here to see what the other designers created, and cast your vote for your favorite! What can one say, but gorgeous! Love poppies and love the colors you chose! Absolutely stunning, Lisa! I love the butterflies cut from the image! Beautiful card! 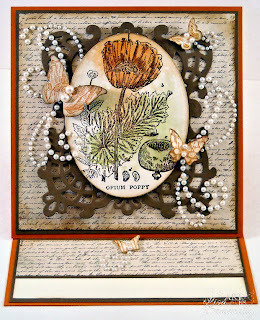 Love the Poppy Butterflies! Gorgeous design. Looks gorgeous, love the marker wash technique you chose. Best of luck to you! Oh what a wonderfully whimsical piece this is! Good Luck to you too! Wonderful entry, wish you luck. Love the poppy image and your beautiful card. I love this stamp and what you did with it. So gorgeous. "100 Proof Press" mean? That it would come out the same if you gave directions and tried it 100 times? I love all of the pearls, and the text background is beautiful. I really like the die-cut shape used in the background!